Supporters of Shiite cleric Muqtada al-Sadr carry his image as they celebrate in Tahrir Square, Baghdad, Iraq, Monday, after the political alliance he backs appeared to gain the most votes in parliamentary elections. Sadr, known for leading a militia that carried out deadly attacks on U.S. forces after the 2003 invasion of Iraq, did not run as a candidate himself and has no formal political role. But he backs a political alliance whose contenders looked likely to win the most votes across most of the country this weekend, according to preliminary results. That means Sadr will play a decisive role in assembling a new government. The cleric is from a revered family of religious scholars and commands millions of followers. While in recent years he has reached out to other countries, including Saudi Arabia, he doesn't meet with U.S. officials and rejects Iranian interference. The weakened support for the incumbent Abadi, a U.K.-educated engineer considered a moderate, tosses aside U.S. assumptions that Iraq would continue on the course he has steered. "Everyone is concerned, we just don't know what to expect," said a Western diplomat who asked to remain anonymous to discuss Iraqi politics. For months last year, Sadr gathered his followers to protest at the gates of Baghdad's barricaded Green Zone, the seat of the Iraqi government. He abruptly dismantled his movement's political wing to form a new alliance that broadened his support beyond his traditional base by including secular groups and communists. His allies campaigned on issues such as easing poverty, improving public services and combating corruption. The Shiite Muslim cleric instructed his followers to vote not on the basis of religion but for qualified technocrats. With results counted in more than half of Iraq's 19 provinces, electoral officials said the second-largest number of votes went to a political alliance led by Hadi al-Amiri, a former militia leader with strong ties to Iran. Saturday's vote was the first parliamentary election since ISIS took over large parts of the country in 2014. Iraqi security forces and former militia groups now nominally under control of the Iraqi government drove ISIS from most of Iraq last year. Abadi, who was commander in chief of the armed forces during three years of difficult fighting, did well in liberated cities including Mosul. But his showing was thought to have been hurt by a split within his Dawa party. He and former Prime Minister Nouri al-Maliki, both Dawa officials, ran on separate candidate lists, splitting the vote for the party. Abadi, who has maintained good relations with both the United States and Iran, could still have a senior role in a governing coalition. "We are ready to work and cooperate in forming the strongest government for Iraq, free of corruption," he said in a televised address. Government corruption was one of the main reasons many voters turned away from traditional parties or stayed away from the polls altogether. The country's most revered Shiite religious scholar, Grand Ayatollah Ali al-Sistani, instructed voters not to re-elect politicians who had already served and failed. Only 44.5 percent of Iraqi voters turned out to cast ballots — the lowest percentage in the country's parliamentary elections since 2003. The winning parties are likely to take weeks to form a coalition government. Any coalition backed by Sadr will be unlikely to include Maliki, a bitter enemy. As prime minister in 2007, Maliki sent Iraqi forces to fight Sadr's Mahdi Army in southern Iraq. 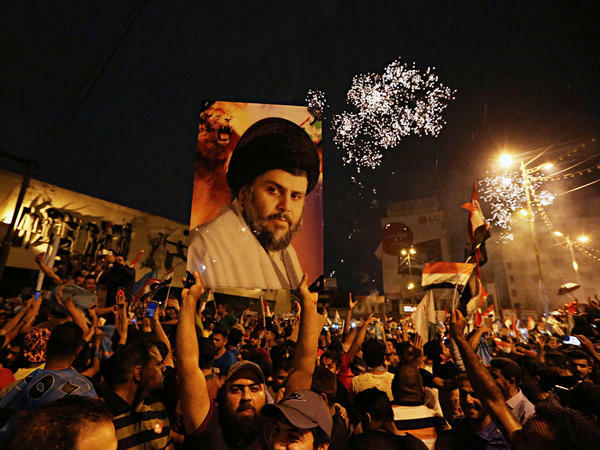 As electoral officials announced preliminary results late Sunday, Sadr supporters gathered in Baghdad's Tahrir Square to celebrate. "Bye bye, Nouri al-Maliki," many of them chanted. Now to Iraq, where people this weekend voted in the country's first election since ISIS was defeated. It was a parliamentary election. And the results have been a surprise. Many expected prime minister Haider al-Abadi to win the most votes. Instead, he has come in third. The big winner is Shiite cleric Muqtada al-Sadr, whose militia fought U.S. troops after the invasion of Iraq. NPR's Jane Arraf joins us now from Baghdad. And Jane, how did this happen? JANE ARRAF, BYLINE: Well, Ari, I guess for one thing, these actually were real elections with a wide variety of candidates, and people had a choice. So Sadr has a huge following. We have to remember that. He can command millions of followers because he comes from a revered Shia family. And then there were new parties. For the first time, there were militia candidates, which had the second-biggest showing. But the really big surprise wasn't even so much that Sadr did so well with his coalition. It was that Abadi, Prime Minister Abadi, did so poorly. And that's partly because there's a split in his party and partly because people were really fed up with politicians, particularly the old politicians. SHAPIRO: What does this mean for American interests in Iraq? ARRAF: Yeah. That's a great question. They are scrambling to figure that out, along with all of the other Western countries here, because for the first time, now what we're looking at is somebody who can form a government. And we have to remember that Muqtada al-Sadr, who fought U.S. troops in 2003 with his Mahdi Army, he didn't run as a candidate. So he's not going to be prime minister, but he will have a determining role because his party has gotten the most votes. So he could very well form a coalition. And they could, if they wanted to, decide that they want to go in a different direction with the U.S., with the U.S. military presence here, for instance. There's also a lot of economic issues here because the alliance that Sadr formed, he formed it with communists. So there's going to be a big emphasis on state-run programs, possibly even a return in some respects to a state-run economy. And then the U.S. is also worried about the relation with Iran, what kind of relationship a new government will have with Iran. SHAPIRO: Yeah. So you have this religious cleric forming an alliance with communists, perhaps with a different relationship with Iran. What would this government actually look like once it forms? ARRAF: So that's one of the really fascinating things about Iraqi elections because it's a parliamentary system, so the votes are still coming in. We just had a press conference just a few minutes ago, and it indicates that Sadr is still in the lead with that coalition. But after all the votes are counted and all the allegations of fraud are dealt with, then they're going to have to sit down all of these leaders and try to come up with a coalition that will govern. So there's a lot of bargaining, a lot of horse-trading. There's a big split between a lot of the parties. Now, Sadr is one of the ones who is not the closest to Iran. In fact, he's had an uneasy relationship with that country. But there are other groups, like the former militias, that are Iranian-backed. So that's going to be one of the big factors in how this all comes together. But what we do know is it won't come together quickly. SHAPIRO: So the U.S. has been pushing for democracy in Iraq. And as democracy happened, it might have produced an outcome the U.S. may not have wished for. ARRAF: Absolutely. This was a little bit unexpected, but it is definitely democracy. SHAPIRO: NPR's Jane Arraf in Baghdad. Thanks, Jane. (SOUNDBITE OF JAN KPAYE'S "FINGER SMITH") Transcript provided by NPR, Copyright NPR.